Hundreds of years of human directed impact, first over-grazing and then subdivision and abandonment, degraded this once fertile rangeland. improving water quality and water resources. We want to try something different. We want to rebuild the landscape’s natural capital so residents can enjoy the dividends for generations to come. Watch Adelante’s president, Virginia Smith, explain her vision of what the future of the San Clemente rangeland holds. 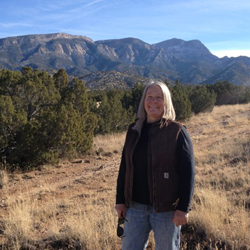 Virginia Smith began developing the Bar Lazy S Ranch in 2002 through a series of small farm enterprises on this land located in the San Clemente Land Grant near Los Lunas. These enterprises have included trail rides, grassfed beef, and fiber sheep. The focus has now turned to rangeland restoration to develop a productive resource base for the ranch. For more information about rangeland restoration, please contact Virginia.